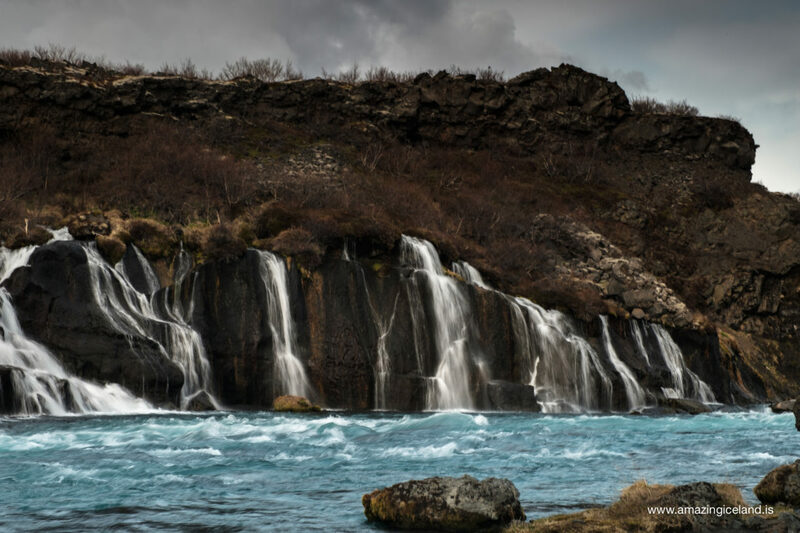 Hraunfossar (lava falls) is the name of a 1 km row of beautiful little waterfalls that flow from underneath Hallmundarhraun lava and into the river Hvítá at a point called Gráhraun or Gray lava. 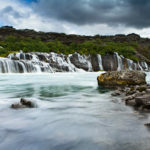 The water in the waterfalls is crystal clear spring water, while the river Hvítá contains glacial water so the contrasts of the waterfalls and the river Hvítá are high. The waterfalls themselves are formed by groundwater flowing from underneath the lava. Due to the fact that Hallmundarhraun is new and fresh lava, all the water descends and seeps through the lava and consequently there are no rivers on the surface of the lava. Under the porous lava, however, there are older and denser soil layers. Precipitation that falls on Hallmundarhraun flows there for relatively shallow under the lava on a dense strata. 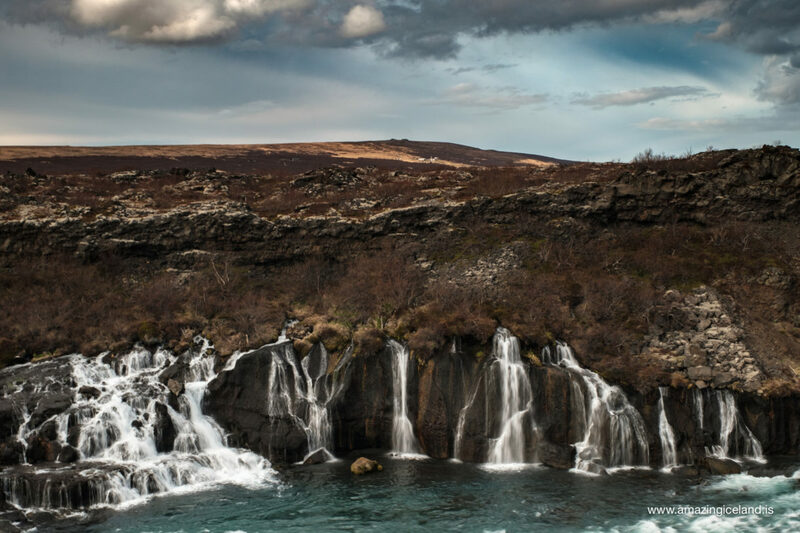 As Hvítá flows outside of Hallmundarhraun below Barnafoss, she has dug down far below the lava and the dense soil below it. 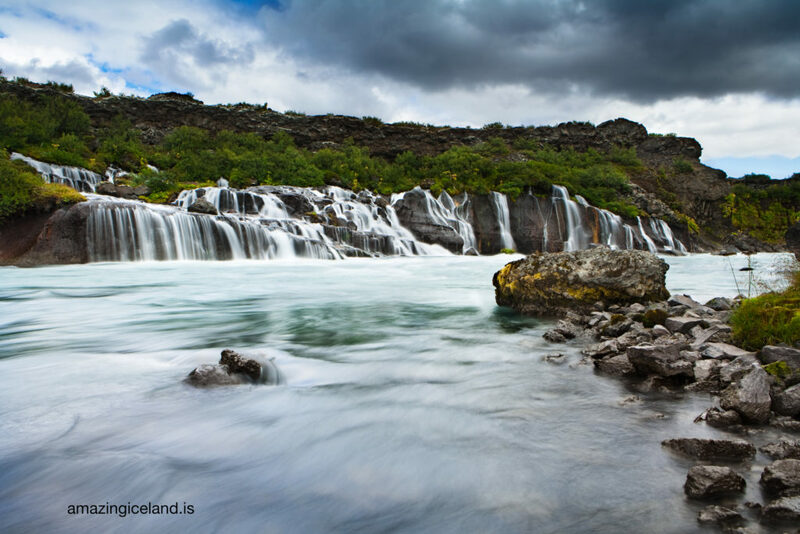 For this reason, the groundwater flows from the lava in a long section and falls into river Hvítá in Hraunfossar waterfalls. How was the lava Hallmundarhraun created? In the early part of the 10th century there was a great volcanic eruption in the craters beside and below the edge of the glacier Langjökull, the second largest glacier in Iceland. From these craters the lava called Hallmundarhraun ran, it is the largest lavaflow of Borgarfjördur in modern times. The volcanic eruption has probably been protracted, possibly for a continuous period of several years, and the lava flow flowed about 50 km west of the craters, north of the glacier Eiríksjökull and Mt. Strútur, and up to the current bank of river Hvítá where Hraunfossar waterfalls are. It is impossible to predict Hvítaár’s route before the lava flows, but the river has probably switched very quickly to the outer edge of the lava after it stopped flowing. Above the waterfalls Hraunfossar is an area with small waterfalls or floods in the river Hvítá, these are called Barnafoss or children falls. 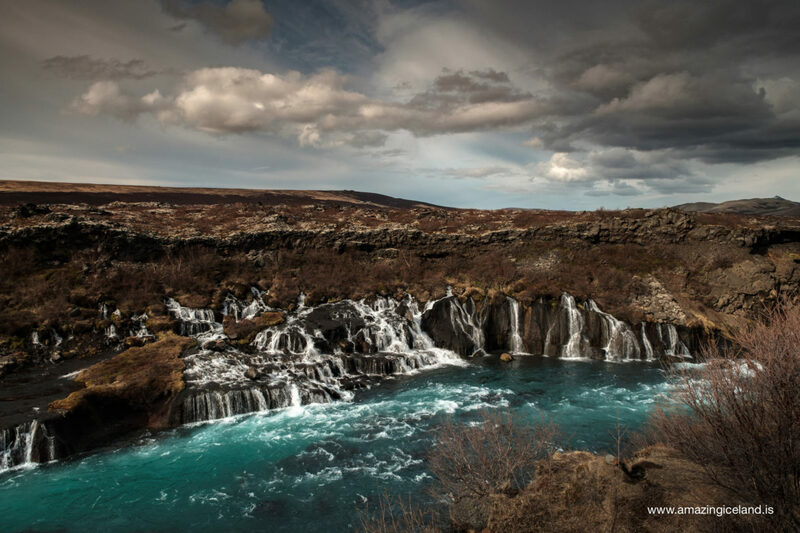 There, Hvítá falls out of the lava, slowly digging itself into the soft lava rim and forming a shallow canyon. At Barnafoss there have been found rock arches over the river, but the rock arches are formed at the bottom of the river in the lava gorge where the river digs through. This carving is at its highest during flooding of the river when it flows over its banks as can clearly be seen in the surroundings of Barnafossar waterfalls. 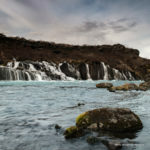 The name Barnafoss or children falls is said to come from a folklore of children going out on one of the stone arch over the river and falling in. After the incident the mother broke down the arch so no other children would be harmed. There is a viewpoint right from the car park that provides you with the most amazing view over the waterfall, river and the birch surrounding. The pedestrian bridge across the river was originally built in 1891 and renovated exactly a century later. The waterfalls have been protected as a National Monument since the year 1987. The waterfalls are located in Borgarfjörður the West part of Iceland about 118,5 km away from Reykjavík.